When a film is made about video-game culture there are high expectations about how it will best represent an entertainment industry that has so many dedicated fans, especially when the film attempts to deal with multiple decades of cultural production. Wreck-It Ralph (2012) takes this task in hand by portraying Pac-Man to contemporary first-person shooters with a large dose of references to favourite games such as Sonic the Hedgehog, Street Fighter and Mortal Combat. While it has had somewhat mixed reviews with critical concern that its plot and characters are not as well constructed as other CG animations, what it does offer is an imaginative visual feast that taps into nostalgia and yearning for games of the past. This is all the more impressive considering high levels of permission were needed from games companies in order to use their characters. It is an industry that is not always known for its generosity with its intellectual copyright, meaning that Wreck-It Ralph and its potential sequel have done well to include so much of gaming culture. 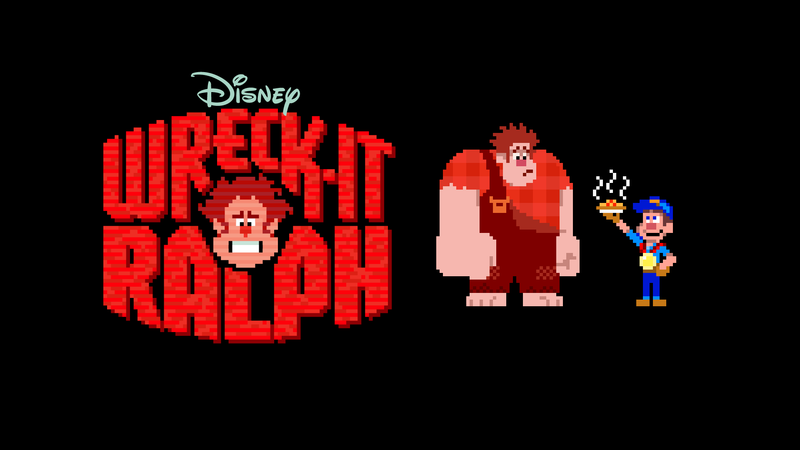 At the beginning of the film, we see an arcade machine that contains the Fix-It Felix Jr. game, home to the eponymous hero of the film, Wreck-It Ralph. The curved edges of the arcade machine make it clear that we are seeing a screen within a screen and it is inside the inner screen that the images are heavily pixelated, 8-bit graphic representations of the characters and the house that Ralph wrecks and Felix fixes. At times the pixelated world fills the whole screen, giving its flat representation a striking contrast to the stereoscopic depth available in the images of the ‘external’ world in the arcade. 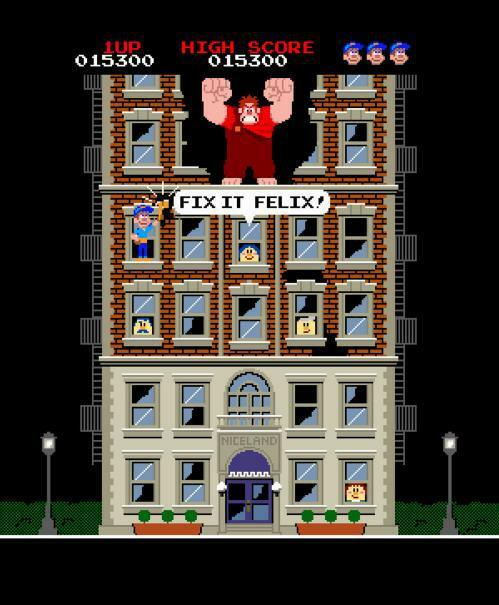 In these moments, when the Fix-It Felix game takes up the full screen, we see a world with its own inner logic and modes of being. There is a clear irony when children standing in front of the game say “this animation is so real.” Compared to the sophisticated animation in the arcade scenes, particularly with the addition of 3D effects, Ralph and Felix are crude, elementary figures that participate in geometrical formations that are a far cry from the levels of photo-realism operating in current gaming. The sense that we have moved towards greater and more effective methods of animation is reinforced when we see ‘inside’ the Fix-It Felix world and no longer watch through the screen of the arcade machine. In this instance, the characters are depicted in the same rounded and smooth tones that are common to computer-generated animation coming from studios such as Pixar and Disney. They have evolved into three-dimensional bodies and carry this aspect with them when they are in the arcade and not seen in their own game world. However, while the concern may seem to be with greater realism, and Pixar’s three-dimensional animation style has often been hailed for accomplishing this, the variety of visual formats on offer in Wreck-It Ralph make it clear that there is no one preferred mode. Rather than getting closer to photographic depiction, the film continuously loops through different visual states that each have their own unique capacity: the glassy surfaces of first-person shooters in the Hero’s Duty game, the saccharine sugar-coated pastels in the Sugar Rush game, the jerky movement in Street Fighter. It reminds us that we are capable of enjoying different visual modes and that we are accustomed to seeing alternative ways of depicting events and locations. In this respect, the stereoscopic effects come into play most strongly in the ‘external’ world visualisation and are not added on to all of the older game representations. Wreck-It Ralph does not suggest that 3D is somehow the natural end-point for effective representation, a quality that can be tagged on to upgrade older models of imaging. Instead it uses stereoscopy as a tool to bring out certain qualities in the CG worlds, most obviously in the scenes in the arcade, Sugar Rush and Hero’s Duty. In the arcade scenes and in Sugar Rush, the rounded faces of characters with nasal appendages and bulging cheeks (common to stereoscopic Pixar animation) protrude and swell out towards the audience. Similarly, Ralph’s gigantic hands take on an exaggerated colossal quality as their three-dimensional grandeur hang in stereoscopic space. 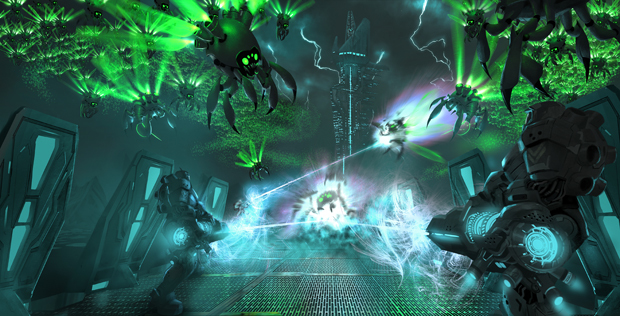 In Hero’s Duty, large green insects zip around the screen space, providing a type of buzzing mass that flies at the viewer. They are aided by stereoscopic debris from shattering metal shards, smoke, laser beams and exploding green goo, all of which work with the emphasised depth configurations to provide a sensory overload. The logic of how the different gaming worlds interconnect makes no sense (how characters can exist in different material and visual states; how they travel from game to game through power cords; how they can exist outside their game when the code that created them is extinguished when the game is turned off) but that is not the point. Like other computer game based films such as Tron (1982) and its recent 3D update Tron: Legacy (2010), we have to suspend disbelief in relation to how laws of physics may operate. When Vanellope ‘the glitch’ begins to disintegrate at different points in Sugar Rush, we see a representation of her digital code, a materialisation of something that it is otherwise unviewable. It indicates that all that is visible in this film is in one way or another an optical illusion that can and will break-down at any given moment. These elements make for an exhilarating film that shows the immense potential for different, dynamic ways of using visual form. It taps into the opportunity for new stylistic modes that digital 3D cinema has brought about while also celebrating older forms in recent culture.